The success of your CRM program will be dependent on how you use your data. Many people become leaders by accident. Suddenly they’re thrust into a position of having to make decisions, and they either bloom or crumble under the pressure. If they find early success from following their intuition (and some good luck), they may start to think they’re smarter than everyone else in the room. But here’s the secret: They’re not. For better, more consistent results, don’t base business decisions solely on intuition and conjecture; operate with a data-driven mindset instead. When you make decisions, more and better data guides you to be more prudent, reducing your exposure to risk. That isn’t to say that you should succumb to “analysis paralysis,” waiting until you have a mountain of data before you make a decision. After all, one mark of a good leader is knowing when to say something is “good enough.” Sometimes, the tip of the iceberg is enough to point you in the right direction. Requiring people to back up claims with data should become a cultural norm that drives your organization to make better decisions more consistently. If someone comes to you and says, “We should invest more in advertising through social media channels,” she should be able to back up that opinion with data. How many impressions will you get for every dollar you spend? Of your various campaigns, how many impressions does it take to create a click to your website? How relevant to your product or service are the people who click those links? On average, how much does it cost to generate a sales qualified lead from pay-per-click advertising? On average, how much money does it take to generate a customer from social media? How long does it take a lead to become a customer? How does this vary between different marketing channels? Is the time and cost to obtain a client through social media better than pay-per-click advertising? Are you retargeting leads with ads on social media, and is it working? Are you generating leads through content syndication (writing blogs or stories and having other companies share them on other websites), and how much does it cost? When the marketing team is able to answer these questions and report on them to the sales and management teams, you can see how to spend your money most effectively. With a good CRM, you can track different campaigns and see which salespeople are your best performers. Insight into sales and marketing successes helps you channel their efforts to maximize productivity and growth. If you aren’t able to get specific answers to these questions from your marketing team, they can improve how they’re serving your organization. All these are well within the capabilities of software, with little to no technical experience required. 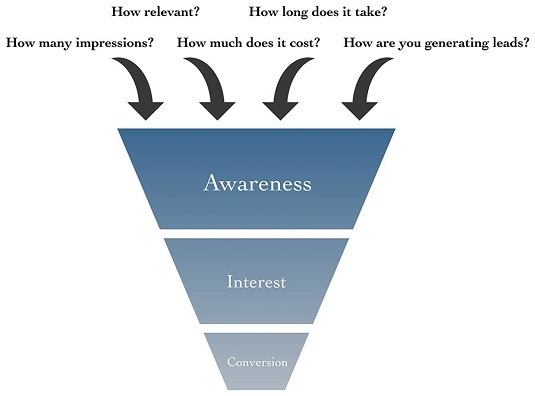 This image shows how these questions directly impact the flow of leads into your sales funnel. The better you can answer these questions, the clearer your understanding of how the sales process works. Know answers to questions that impact your marketing and sales. By asking these questions, you make your sales and marketing teams more accountable. Money spent on advertising and marketing is an important part of the company’s budget, and that budget has limits. The more you can hone in on what works and what doesn’t, the more effective your advertising and marketing will be. Your goal is to minimize the cost to bring in a client, while maximizing the amount of money each client pays you. Marketing and sales work together to achieve those goals. Break down the silos between these departments to maximize your conversion chances and minimize the cost to bring in a new client. The same goes with anything you invest in, whether it is internal (for example, developing your product or service) or external (such as hiring another salesperson). The more you can rely on data to help you make decisions, the more confident you’ll be in making those decisions. In the absence of data, you’re at least cognizant of that increased risk, which probably encourages you to invest in those ideas more gradually. Predictive analytics is a relatively new field that goes a long way toward helping you make data-driven decisions. By looking at what drives conversions (purchases or actions that are valuable to you), you can see what correlates to success. You see mathematical models that tell you how influential your social media ads are in driving customers to buy from you. You can see the influence of salespeople, email campaigns, webpages, and other channels, and you can allocate resources to where you have the strongest correlations to conversions. The key to predictive analytics is getting the whole picture. If you’re only measuring email and webpage traffic, you’re missing many other channels that may be driving people to buy from you. Brand awareness and measuring how your leads begin their customer journeys are important factors that impact your business. Imagine what would happen if you had a significant source of leads coming from people who called in to your company, but you didn’t have a way to track those inbound calls. If you were to take money away from advertising your phone number, you could be hurting your business, but you would only be guessing. Be conscious of what you know and what you don’t know. When you build your data model of how your business works, understand that it probably won’t be 100 percent complete. Try to include as many different ways of interacting with your leads and customers as possible, so you can measure as much of the system as possible.